Sometimes I write recipe posts where I share a recipe at the end and other times I write recipe posts where the recipe is embedded in the post itself. There’s a reason for that! Recipe posts where the recipe’s at the end are the kinds of recipes where specific amounts matter; recipe posts where I just write a recipe as part of a larger narrative are recipes where you can just wing it. So, Sam Sifton’s Pear Cobbler? You need to follow those instructions. But my Butternut Squash Soup with Whiskey Ginger Cream? That’s a totally improvised recipe and I wanted to give you the power to improvise your own version. If I’d written that with specific amounts, chances are you would’ve just replicated what I did instead of doing it your own way. The soup will taste better if you do it your way. 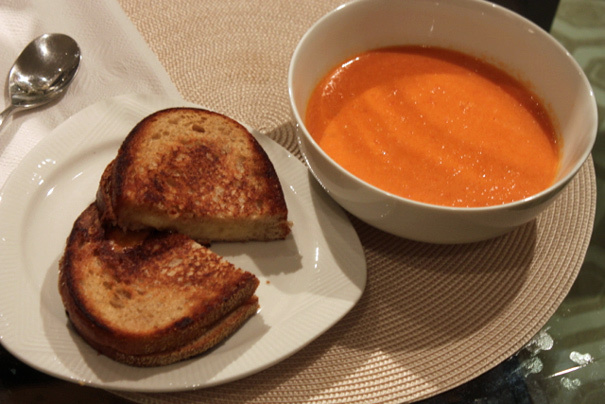 Allow me to illustrate that with a dinner from last week: tomato soup and grilled cheese. If the soup had been too thick, I would’ve added more water; as it was, it was just right. Only, I wanted a creamier soup so I added (drumroll): cream! Just until the soup turned pink. I tasted for salt and voila, I was done. 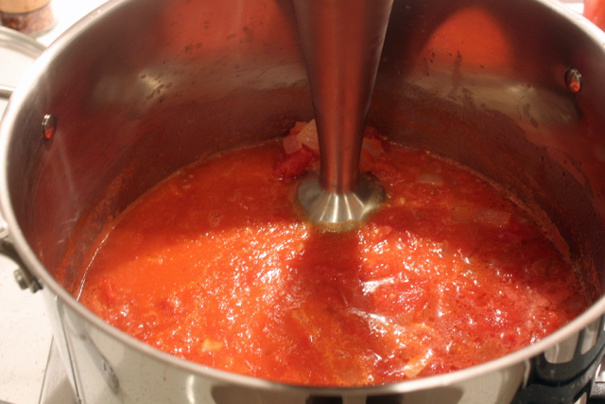 So that’s my very casual tomato soup recipe. (If you want to gussy things up further, you could add Sriracha and blue cheese, like Michael Symon does in his recipe.) And as for my very casual grilled cheese recipe, I can do that in one sentence: make a cheese sandwich, put 2 tablespoons of butter in a skillet on high heat and when the foam goes down and the butter’s super hot, lower the sandwich in and fry on both sides. That’s grilled cheese. And that’s my casual approach to recipes. It’s not so much laziness as it is an unwillingness to nail down specific amounts. If that doesn’t work for you, I definitely understand. We’ll just have to call off the wedding!